Burger Yacht Hull Refit Project in Fort Lauderdale by Dolfab, Inc.
75’ Burger Yacht Diane was in Fort Lauderdale undergoing a yacht hull refit by Dolfab Metal Fabrication to replace corroded areas. In order to repair the damage to the hull, it was necessary to not just repair, but actually replace sections of the yacht’s structure. 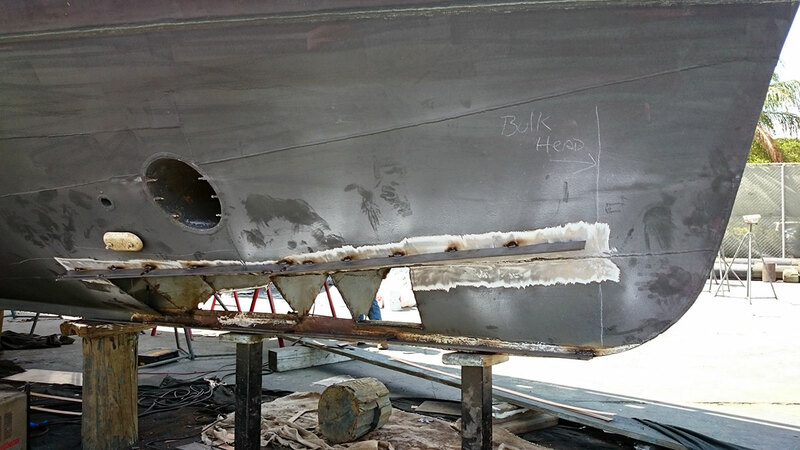 To accomplish this hull refit job, Dolfab crew cut out sections of the hull, welding in strongbacks to keep it from warping. The strongbacks are necessary to ensure the vessel retains its shape. When a section of the hull is missing, it creates an uneven distribution of weight. This undue stress on the hull structure then leads to deviations in the lines and shape of the hull and will most definitely cause major problems later. As the strongbacks were put in place and the damaged sections were removed, it was time to create new sections to replace them. Accuracy and precise measurements are paramount during the entire process, especially during this phase. These custom made metal pieces have to be measured, cut, and produced to exact measurements. Our team of expert metal workers cut, sanded, and polished large pieces of metal to fabricate these replacement pieces. Once the new sections were ready, they were welded in place by our expert welders and the vessel was pressure-tested to ensure it was water-tight. The hull was then finished, painted, and brought back to life by the folks at Yacht Management, and the hull refit was complete. This Burger yacht is like brand new again! View this project’s photos in our Project Gallery.